Almotech, a Galway company has designed a new music system for retailers that will allow them to take control of the music played, and drop in commercials. WHAT DO lifts, supermarkets, hotel lobbies and shopping centres all have in common? Mood music. 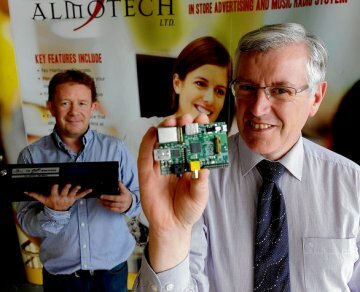 There is no getting away from it in most public places and the founders of Galway-based Almotech don’t want you to. Silence may be golden but not if you are in the background music business. Almotech was founded in 2008 by electronics engineer Vivian Dooley and businessman PJ O’Connor to produce digital jukeboxes for the pub trade in the UK. Things went well initially but as the downturn began to bite, the sector went into a steep decline. “Pubs were closing at a rate of over 50 a week, so there was big trouble looming. Unless we could rapidly find a substitute business, we were going to be a casualty of the Celtic Tiger,” says Dooley. While some people would have been paralysed by the prospect of their business going under, Dooley and O’Connor were galvanised. “I had an idea in my mind for a long time around transforming the background music business,” says Dooley, whose background is in IT troubleshooting. The new in-store radio and digital music management system is called Zon@t, and it allows the user to create a playlist or a mix of music and information for their business. They can choose the music from a library of more than 100,000 tracks in all styles from jazz to the latest chart hits and can add their own content in real time. For example, it is possible to make and upload small commercials to tell customers about in-store offers. The ads are recorded in-house and can be playing within minutes at no extra cost to the user. News, sports bulletins and announcements of local interest can be added. In larger premises, such as shopping centres, advertising slots can be sold on to third parties. All that is required to make Zon@t work, is an amplifier and an internet connection. “We started with a blank sheet and developed all the hardware and software in-house. Early prototypes were put into local outlets here in Galway to get customer feedback. We launched on a very small scale in 2010 and in 2011 we got approval from Musgraves and the system is in 145 of its SuperValu stores. We have around 800 customers in Ireland and are the system of choice across a wide variety of outlets from food and clothing retailers to service stations. We are also expanding into UK and continental Europe. “The system is web-enabled so the user can manage their playlists and scheduling from any computer for one or multiple outlets,” says Dooley. “However it is not a streaming device so people should have no worries about bandwidth usage on their internet connection. “We use cloud storage and web applications together with the latest in hardware innovations including mobile devices. Our latest products are using devices such as Raspberry Pi with powerful graphic capabilities and huge cost savings,” he says. Almotech employs 19 people and is owned by the founders with equity participation by Enterprise Ireland, the Western Development Commission and AIB Seed Capital. “We had some money to set up the new business but we also raised €750,000 in funding in 2011 and a further €650,000 this year – no mean feat in the current climate,” says Dooley. The background music business is dominated by Canadian multinational, Mood Media, which has shown interest in Almotech. “We’re really only at the beginning and we believe there is plenty of room for growth across all our markets. We’d like to build value in the company before we’d consider selling at some time in the future,” says Dooley. “We are a good example of import substitution on the one hand while our major focus is exporting on the other. It’s a win-win. Only 40 per cent of sales to date have been replacing existing systems. The rest are outlets that have never had a managed music system before. “What really sets us apart is the cost efficiency of our service,” says Dooley. “We’re the Ryanair of our sector. I am very into technology so I’m aware of all the latest hardware and how you can do things really well at the lowest cost. The business is built on the DBOM (design, build, operate and maintain) model with no charges for the hardware, installation or maintenance.